This is an alternative Sunday lunch-all the elements are there but served in a slightly different way. I haven’t given a recipe for gravy but you can make a tasty sauce from the remains of the roasting tin. 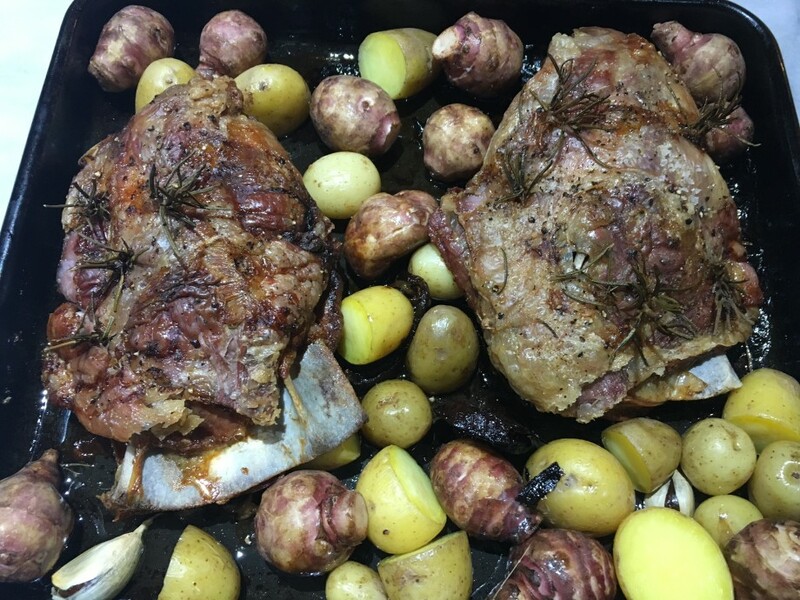 Once the lamb, artichokes and potatoes have been lifted out, I suggest you discard the onion and garlic-which will probably be too well done -but use the fat and any juices to make a good sauce. Redcurrant jelly and mint sauce are non-negotiable in my house – and if you can make a fresh mint sauce with balsamic vinegar then all the better. Heat the oven to fan oven 130˚, mark ½. Scatter the garlic and slices of onion over the base of a large roasting tin. 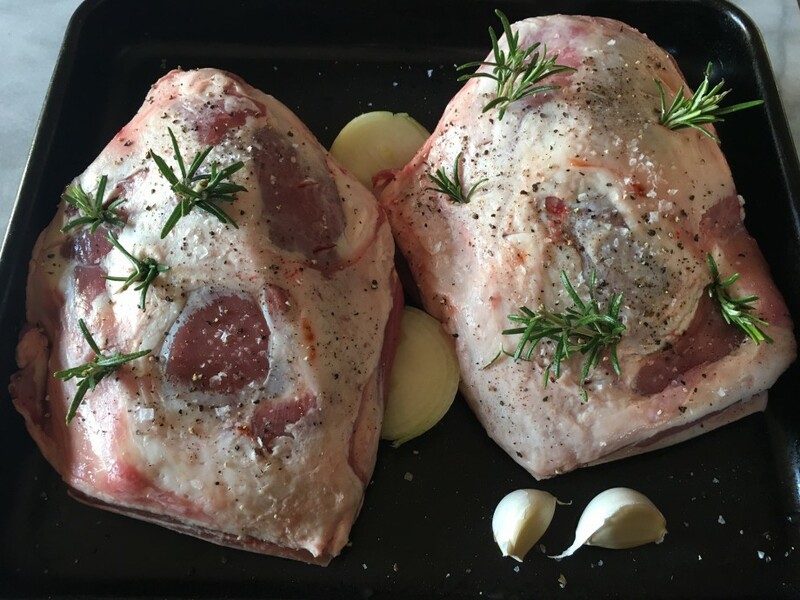 Lay the lamb on top and season well with salt and ground black pepper. Make incisions in the flesh with the tip of a sharp knife and stuff the rosemary into the holes. Pour in 300ml water and roast in the oven for 3 ½ hours. Put the potatoes in a saucepan of salted water and bring to the boil. Cook for 5 minutes, drain thoroughly and set aside. Turn the oven up to 200˚c, fan oven 180˚c, mark 6. 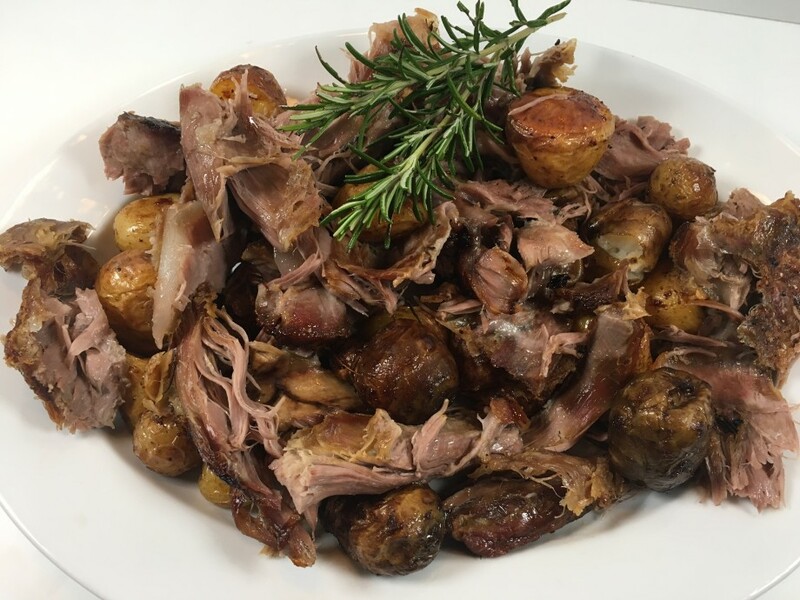 Take the lamb out of the oven and scatter the potatoes and Jerusalem artichokes around the meat, giving them a stir to baste them in the fat and pan juices. Roast for 30 minutes then give the vegetables another stir around and continue to roast for a further 15-20 minutes until golden and cooked through. Turn the oven down to its lowest setting. Spoon the potatoes and artichokes onto a serving dish and keep warm in the oven. Pull the lamb off the bone-it should fall away easily and cut into large pieces. Arrange over the vegetables and serve with mint sauce and redcurrant jelly on the side.